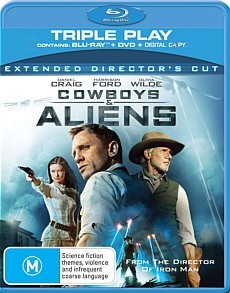 Cowboys vs. Aliens Blu-ray Review I think a lot of comic book and video game fans are going to love this film. Having seen the movie, the Blu-ray release of Cowboys vs. Aliens looks amazing on this format with some amazing attention to detail. Even though the film has this earthy feel to it, the 1080p release features exceptionally sharp images and colours that jump out at you. Audio is equally good, thanks to the 5.1 DTS-HD Master Audio track. For special features, we have audio commentary with Director Jon Favreau, Conversations with John Favreau and a featurette entitled Igniting the Sky: The Making of Cowboys and Aliens. The featurettes are a little light on information, however the commentary track is quite insightful and Favreau is an interesting director. A DVD version and a digital copy of the film is also included.